Design your own look by choosing the features, functions or sections that suit your business. Create a custom look by adding your own images that promote your products / services. Change the colours and fonts to best represent your brand. Please be aware that moving or adding buttons, links or menus, or requiring certain functions or animations to behave differently within a theme requires custom development which incurs additional charges. You can view the home pages of each theme below. To view all pages within each website theme, please click the "Use this theme" link. We will call you and give you access to the complete theme. Search function in the header. Social media links in the footer. Contact Us forms on every page. Header menu sits on its own row. Allows 7 - 8 menu options. Banner contains a full page single image. The image sits in the background. Banner includes a call to action. Home 1 page – multi-coloured navigational tiles with Title, description and related icon. Tiles are animated when you move the cursor over them. Home 2 page – multi-coloured navigational tiles with Title, description and related image. Tiles are animated when you move the cursor over them..
Home 3 page – the call to action is below the navigational tiles which are the same as the default home page. Section 1 – two column text with heading. Section 2 – three column text with heading and images above each column. Section 3 – one column text with heading. Section 4 – banner image with call to action and client references. Links for navigational menu are located on the left of the page. Navigate to sub-categories of products / services or to other products / services offered. Service 1 page – background is an image. Title / heading is positioned in the content area of the page. Service 2 page – background is an image. Title / heading and call to action are positioned as a banner. Service 3 page – background is a colour of your choice. Title / heading is positioned in the content area of the page. 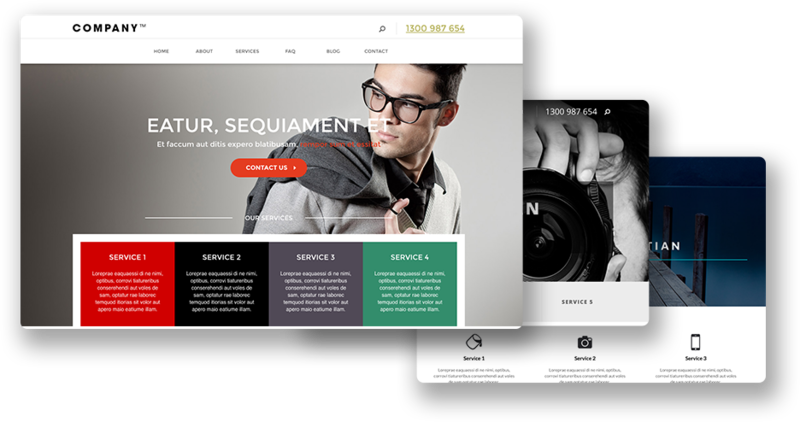 Service 4 page – background is a colour of your choice. Title / heading and call to action are positioned as a banner. Service 5 page – banner contains a narrow landscape image. Title / heading is positioned in the content area of the page. Service 6 page – banner contains a narrow landscape image. Title / heading and call to action are positioned in the banner. Service 7 page – banner contains a narrow colour strip of your choice. Title / heading and call to action are positioned in the banner. An accordion feature expands and contracts the information as you click on the arrows. Displays a title, date, images, categories and author profile section. Images are displayed as thumbnails. Contains a google map, contact details section, and an email form. An image of your location or office could be used in the background. Header menu sits on same row as your logo and phone number. Limited to 5 maybe 6 menu options. Banner contains a full screen width, single image. Navigational tiles display icons with a text description of your products / services. Section 1 – one column text with heading. Section 2 – banner with image and one column text with heading. Section 3 – three column text with headings for each column. Section 4 – two column text with heading. Links for navigational menu are located on the right of the page. Navigate to sub-categories of products / services or to other products / services offered. Service 1 page – there is no banner. Title / heading is positioned in the content area of the page. Service 2 page – banner contains a narrow landscape image. Title / heading is positioned in the banner. Service 3 page – banner contains a narrow landscape image. Title / heading is positioned in the content area of the page. Service 4 page – banner contains a colour of your choice. Title / heading is positioned in the banner. Service 5 page – banner contains a colour of your choice. Title / heading is positioned in the content area of the page. Contains a google map, contact details section, and an email form. An image of your location or office could be used in the banner. Banner contains a narrow, full screen width, single image. The image sits in the background. Navigational tiles allow for product / service descriptions which change colour when you hover over the links. Section 1 – one column text with heading and contact us link. Section 2 – banner image with four animated icons and headings that may link to other pages. Section 3 – three column text with heading and images in each column. Section 5 – newsletter / ebook / helpful tips subscription. Section 6 – contact us details form. Banner contains a narrow landscape style single image. Section 2 – two columns – text on the left, image on the right. Section 3 – two columns – image on the left, text on the right. 1 option to display content on the Product / Service pages. No provision for a banner or images. Contains a google map, contact details section, and an email form. Banner contains a carousel for scrolling images. Navigational tiles allow for product / service description with animation when you hover over the links. Section 1 – narrow section with a call to action and link. Section 2 – one column text with heading. Section 3 – two column text with heading. Section 4 – three column text with heading and images above each column. Section 5 – four column text with icons. Section 6 – two columns, one with text and one with an image. Displays a title, date, images, categories and author profile section. Images are displayed in landscape mode.